Oscar Peterson was born in Montreal in 1925 and grew up on the streets around his home on Delisle Street in those mean, lean years just after the Great Depression. He was the fourth of five children and all of the Peterson kids were introduced to music by their dad, a porter with Canadian Pacific Railways, who was a self-taught piano player. While Oscar`s lessons started when he was quite young, it was in high school that people began to pay attention. Anyone who heard him play knew his level of proficiency had already passed that of “talented amateur.” While still going to Montreal High, Oscar started to take lessons with Paul de Marky, a Hungarian-born classical pianist. Although he worked with Oscar on technique, de Marky`s main contribution just may have been his ability to instill in the teenager a belief that he could have a successful career in music. No one, however, at that time could have imagined the international acclaim that awaited the young Oscar Peterson. His first break came at just 14 years of age when he won a national amateur talent contest organized by the Canadian Broadcasting Corporation. This was the era of live radio, even at the local level and Oscar soon had a regular job playing on a weekly program at Montreal radio station, CKAC. By time he was 20 he was being heard nationally on CBC radio. In the early part of his career he also played with the Johnny Holmes dance band and formed his own trio in the late 1940`s. It was somewhere during 1948 that Oscar came to the attention of the legendary National Film Board producer and director, Norman McLaren. McLaren was working on a short film, Begone Dull Care. The 8 minute movie saw fluid lines and vibrant colours all seemingly choreographed to music supplied by Oscar Peterson on piano, Auston Roberts on bass and Clarence Jones on drums. About one year later, in September of 1949, Oscar Peterson had his own trio and was ready for a quite remarkable debut at Carnegie Hall in New York City. From that moment on, Oscar Peterson became a force to be reckoned with and his fame grew around the world. He would go on to record something like 100 albums under his own name and he often turned up playing on other recording sessions for people like Louis Armstrong, Coleman Hawkins, Lester Young, and many many others. Not content to just play music, Peterson set out to become a composer. Two of his most famous works are Canadiana Suite, in 1963 and African Suite in 1979. On the eve of Canada`s 100th anniversary, the National Film Board produced the 16 minute film, Celebration which was made up entirely of colour stills filmed and edited together. The film used sections of Peterson`s Canadiana Suite as performed by the Oscar Peterson trio. When director Herbert Ross decided to make a film version of the Woody Allen play, Play It Again, Sam in 1972, Oscar Peterson`s composition “Blues for Allan Felix” was used in the soundtrack. Known around the world, Oscar Peterson has remained a devoted Canadian. He stayed in Montreal until 1958 and then he moved to Toronto where he still makes his home. He has been recognized with Grammy Awards in 1975, 1979, and 1980. Oscar Peterson`s contribution to Canada was first recognized by the government when he was made an Officer in the Order of Canada in 1973 and later elevated to a Companion in the Order of Canada in 1985. 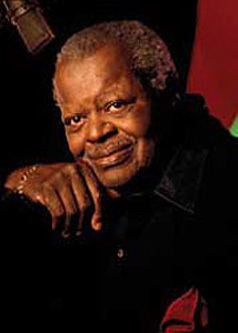 In March of 2001, Oscar Peterson was one of the first two inductees into the Canadian Jazz and Blues Hall of Fame. 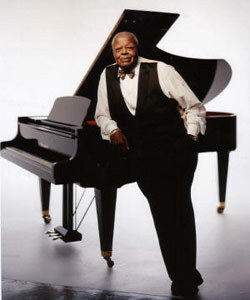 Oscar Peterson died of kidney failure at his home in Mississauga, Ontario four months after his 82nd birthday. Also see: Oscar Peterson’s Filmography. This biography is Copyright © 2007 by Ralph Lucas and may not be reproduced without prior written consent. For more information about copyright, click here.